The PlayFrank Online Casino has been in existence since 2014 and is operated by the established high quality company EveryMatrix Software Ltd of Malta. Their focus is to provide a secure gaming environment and the casino is regularly tested for fair gaming. In the several years of its existence, the provider has also proven that it is trustworthy and readily processes player payouts. The casino has gambling licenses from Malta Gaming Authority and the UK, which are among the world's toughest regulators as they value player protection and regularly review casinos to ensure fair dealing. What distinguishes the casino from many others is the huge selection of games, currently over 1500, from some of the best developers in the industry and there are also some interesting bonus offers. There is also a system of levels which the players can climb where they can be rewarded for their progression. In addition, there are also new daily challenges that reward players. We tested the casino extensively for you and you can read our findings here. The website of this online casino is very transparent and very easy to navigate. At the side you can find a menu that navigates to the different areas and the games are clearly divided into different categories. Registration is very easy and only takes a few minutes. First, you have to enter your e-mail address, a username and a password. The next step is to enter your personal details and choose a currency for the player account. In the final step, you'll need to provide your address and phone number and you can click Register after accepting the terms and conditions. You will then be sent a confirmation link to your e-mail address, and once you have clicked on it, your player account will be activated and you will be able to make your first deposit. As part of their welcome bonus package, there is a bonus available on the first three deposits. For the first deposit it is 100% up to $/€ 100 / 1,000kr and 50 free spins on Starburst. For the second deposit, it is 50% up to $/€ 200 / 2,000kr and another 50 free spins on Starburst. On the third deposit, there is 100 free spins on Starburst. The welcome offer for UK is different. It's only 100% bonus up to 100 pounds + 50 Bonus Spins. The minimum deposit for the bonus is £/$/€ 20 / 200kr. There are also wagering requirements of 35x bonus plus deposit bonus, and 40x free spin winnings. Unfortunately this is a bit higher compared to other casinos. Deposits made with Neteller or Skrill do not qualify for the bonus. The bonus applies to players outside the United Kingdom. UK players can receive a bonus of 100 and 50 free spins for Starburst on their first deposit. Players from Canada get the free spins for Grim Muerto. After you have logged in you can easily make a deposit. Click on the + in the menu on the side. You will then be able to see all the payment methods available to you. These vary depending on the country of your registration. Then select an amount and follow the instructions on the screen to complete the payment. For most payment methods, the amount is credited immediately, but there are also some methods, such as a bank transfer, which can take several days. I chose a credit card for my first deposit and the amount was immediately credited to my player account. There are no fees applied by the casino on deposits. 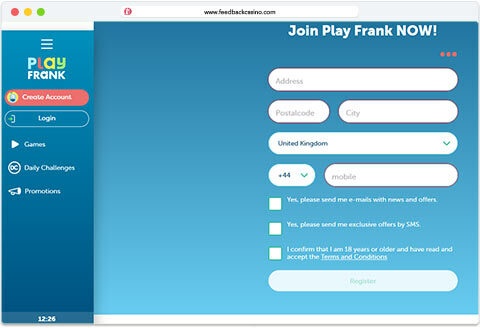 The following game providers are currently on PlayFrank: NetEnt, Betsoft, Play'n Go, NYX Gaming Group, Microgaming, Evolution Gaming, Playson, Stakelogic, Williams Interactive, Quickspin, Pariplay, Spigo, Booming Games, Genii, Habanero, OneXTwo, Gaming Casino, RedRake, Edict, IGT, Nolimitcity and OMI. Some software developers are among the biggest names in the industry, such as NetEnt, Microgaming and Play'n GO, which offer innovative and fun games, but there are also many smaller developers, such as Quickspin and Spigo, which have many interesting games of their own. The platform belonging to Nyx Gaming also contains many games from lesser known developers, which are definitely worth discovering as well. The games can be sorted into different categories, including video slot games, classic slot games, live casino and progressive jackpot jackpot, but under the filters the games can also be sorted by vendor or you can enter the name of the game directly after you search. Unfortunately, the games cannot be sorted by theme or features, which is a pity since it would make finding a game easier considering the huge selection of slots. 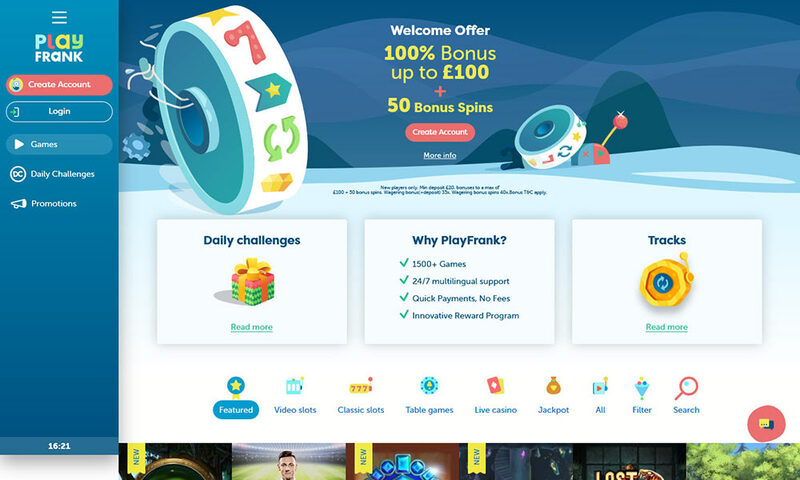 As examples, PlayFrank's slot games include Jumanji, Witchcraft Academy, Lost Relics, Hotline, Sweet Alchemy, Adelia, Baker's Treat, Archangel's Salvation, Legacy of Egypt, and many others. There are also many interesting jackpot games, such as the huge network jackpot slots Mega Fortune, Arabian Nights and Hall of Gods, but there are also many other games, some of them with huge jackpots of their own. If you are interested in traditional casino games, you can find various roulette and blackjack variants in the table games category as well as video poker, casino poker and other classic games. If you're looking for a real casino experience, you can also play against real dealers at the live casino tables. The games can all be played directly within a browser, so you do not have to download any software here. What makes this website interesting is that it has been optimized for mobile devices and you can play most of the games on mobile iOS, Android and Windows Phone devices. In general, many different models of smartphones and tablets are supported, but it depends somewhat on the age of the device since modern devices are more likely to be supported. The website of the casino is well laid out and after logging in you can find a menu on the site where you can see how much your balance is and what daily challenges, promotions and rewards there are. If you click on the small menu with the three bars you can find more options for your player account or unsubscribe. What I find excellent here is that customer service is available around the clock, seven days a week. Employees also speak several languages, including German, English, Swedish, Norwegian and Finnish. You can reach customer support through a live chat or write an e-mail. Telephone support is unfortunately not yet offered. As a customer, I also wrote a message to the support in the chat and promptly received a friendly and helpful answer to my question. The promotions at PlayFrank are diverse. For example, there are promotions for certain games or other events where you can get bonus money or free spins. It pays to come here regularly, because the promotions change. At PlayFrank, there are new missions every day that you can complete and then be rewarded for right afterwards. There are up to three new challenges every 24 hours, which you can see directly on the homepage. Depending on which level you have reached, you can unlock different challenges. There is also another interesting feature on PlayFrank: the tracks levels. Here you will level up as you play your favourite games and monitor your progress. As you climb to higher levels, additional features are unlocked, such as new challenges, and you also get a bonus. This level system is basically the loyalty program in the casino that rewards players when they play a lot there. The casino allows player accounts in various currencies (AUD, EUR, GBP, CAD, NOK, SEK, USD) and also accepts a variety of payment methods, including credit cards, vouchers and electronic wallet. The minimum deposit amount is £/$/€ 20, which also applies to the payouts. With the payouts, we were delighted by the very fast processing times at the casino, usually within 24 hours and there were no fees by the casino. Keep in mind though that the payout may be delayed if your player account has not yet been verified. In this case, the casino will ask you first for a copy of your ID or passport and proof of address. This is a normal procedure prescribed by regulators to make money laundering more difficult. All in all, I found PlayFrank Online Casino to be excellent, suitable for players who enjoy a broad selection of casino games and who enjoy taking advantage of the promotions that are on offer. I enjoyed the daily challenges because they were short so you could play them in between other things during the day. While I liked the bonuses on offer, I did find that the wagering requirements to be higher than some other casinos. Still, there is no denying that the casino offers plenty of free spins to play with. My experience when it came to customer support was that they were professional, friendly to deal with and very helpful. They have round the clock support but at present no telephone hotline so I could not speak to a live person. Still, this is a fantastic casino and would consider it when looking for a new casino.